The Left Coast Press is located in the low-density neighborhood of South Park, just south of Downtown Los Angeles. The project consists of three main programmatic components: the public space, offices and production. Although each program space has particular functional characteristics distinguishing it from the others, these three parts interdependently work together towards the common purpose of producing the daily newspaper. The production is sunken sixteen feet below grade to allow optimum efficiency and truck circulation for the manufacturing. The office space, sixteen feet above grade, is separated into different bars in order to create an intimate working environment and provide maximum natural light and ventilation. The public components, promenade and community forum, are four feet above street level, creating a permeable edge that separates people from the busy street, yet retains an accessible connection. In order to provide a communal establishment for the developing area, the project emphasizes the public component. 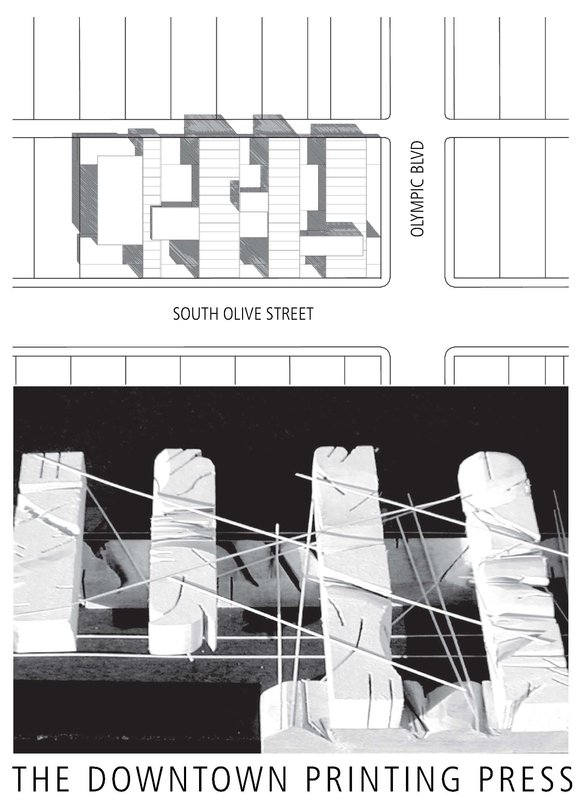 As people walk or drive by the site various elements visually engage the public to explore the project. 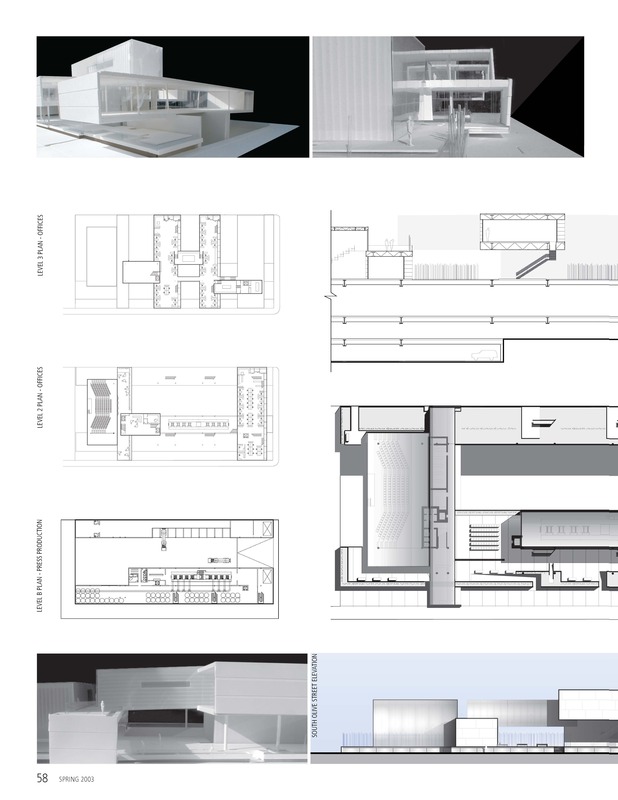 The public space of the project is defined by the production and office spaces of the press. 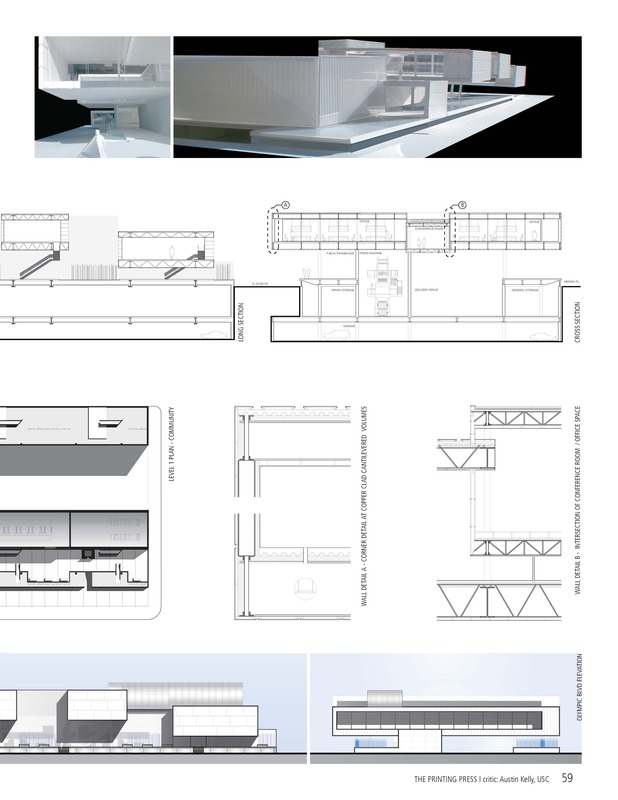 The roof of the production that rises slightly above the sidewalk serves as a public promenade that is rhythmically sheltered by the cantilevered office bars above. The office bars cantilever sixteen feet above the street and reach out to create a visual relationship between the building and the observer. The press machine itself, the vertical core of the project, enclosed by a mesh wall runs along the raised public walk and serves to engage the public into the working of the press. Several ramps flow to the sidewalk and invite pedestrians to walk along the public promenade that spans the length of the project and leads to the public forum. Despite their distinct functions, the programmatic spaces are interrelated so that one can see and feel the presence of each element simultaneously throughout the project.